When you are having roof leaking problems regarding your house typically it is probably coming through the areas surrounding the roof air vent pipes and exhaust pipes. These particular regions usually have rubber boots than can certainly become worn and even cracked over time leaving your home prone to water leaking in. Many times you may never notice the leakage due to the fact that it could just be leaking onto insulation in your attic nevertheless ultimately it will wind up staining your drywall ceiling or perhaps running down walls causing mold complications as well as other structural damage if left unattended. All the plumbing fixtures in your home need air supplied to the drain pipes for the liquid to flow properly, and the pipes poking through the roof are there to provide it. 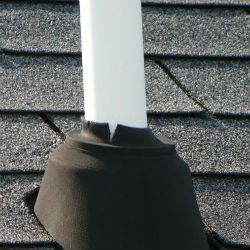 Every home in Florida is required to have at least one plumbing vent above the roof, and most have several.